The BECCA 3P System is major leap in spray gun cleaning and waste recycling processes. 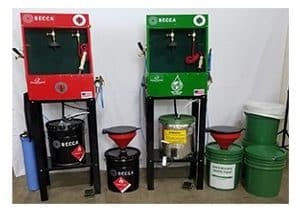 The system combines BECCA’s unique technologies needed for proper cleaning and waste management through a guided selection process that provides the best system for each particular shop application. Process One: Detail clean and polish of the spray gun to get it back to like new condition. If new move on to Process Two. Process Two: Implement the BECCA cleaning system for primer/sealer, base coat, clear coat, or two component materials or single stage materials. Process Three: Select a waste management system that best handles the particular materials whether they are waterborne, solvent, multi-stage, two component, or single stage. 3P in Detail – Now let’s review each step in detail to identify the BECCA tools. Primer/Sealer Spray Gun – BECCA would recommend a manual* system for this process that would take place lessfrequently. Such as the Big Squirt, 40 series, or 50 series gun cleaner. Base Coat Spray Gun – BECCA would recommend a manual* system for this process that would take place more frequently depending on the amount of colors and color changes. If it is a waterborne system we would strongly recommend Heat Systems to be added. Such as the Big Squirt, 40 series, 50 series, or 700 Series. Clear Coat Spray Gun – BECCA would recommend a manual* system for this process. Such as the Big Squirt, 40 series, 50 series, or 700 Series. Note: BECCA’s recommendation for Manual Systems is based on reviews with Top painters and the speed The BECCA Systems process was able to achieve. Process Three – We need to select the best recycling systems to minimize the waste stream from the cleaning process and any other paint related waste. Clarifier Recycling System – This system uses a flocculation compound that allows you to recycler and reuse the cleaning solution over and over! H2O Dry – This system will dry out remaining waterborne paint or cleaning solution allowing it to be legally disposed in the regular waste stream (Testing and paperwork on file is required), eliminating hazardous waste hauling. Note: Significantly reducing the Hazardous waste hauled away. BECCA’s 3P System provides an easy, effective method for cleaning spray guns like no other gun cleaner.